I see them all over social media, and once in a while I hear them in sermons – the inspirational one-liners, the faith-building sound bites. I dread them. Sometimes it’s an out of context Bible verse, but even worse are the quotes which sound like they are Biblically based wisdom, but which might be little more than misleading witticisms. They trouble me because they could easily lead someone in the wrong direction or reinforce a misconception. They usually have an element of truth in them, making them even more dangerous. I use them myself. I wish I didn’t, but they are very seductive. And of course this is just one of dozens of verses instructing us to take our problems to the throne. Very good. Very wise. Very Christian. These days when for many people the phone is their window on the world, I can see too the wisdom of encouraging them not to immediately Google their problems, or share them with the world on social media, but instead to pray and reflect on them. But at the same time, I was troubled as soon as I read the quote, because I could also see a very negative side to it. For a start, it’s an uncompromisingly black and white message. It reminded me immediately of people who say they don’t need anything or anyone but Jesus. It seems like perfect faith on the surface, but I don’t think it’s the message that Jesus Himself gave. I think about the parable of the good Samaritan for example (Luke 10). The traveller who was attacked got his help from a human being. How much of the Samaritan’s motivation came directly from God is a question we could debate, but while I agree that in the perfect world to come we will need nothing but our Lord, the Bible makes it clear that in this broken world we currently inhabit we need each other. God has put people in our lives. He has given us friends to counsel us and support us in our times of need. 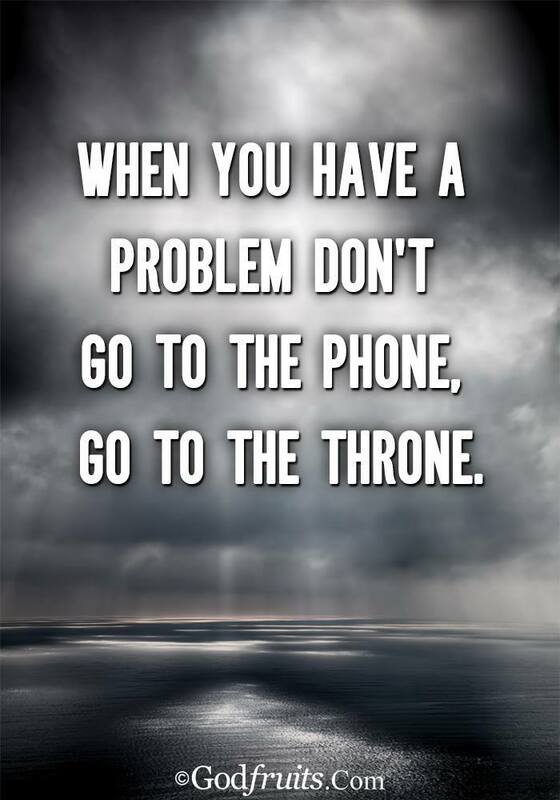 If we have a problem and we go to the phone to call a good friend who can give us the advice, encouragement or the shoulder that we need, then in a sense we have also gone to the throne, because we are using the resources God has made available to us. I have no doubt that most Christian inspirational quotes are well intentioned and useful in many circumstances. But you can’t get the whole story from a soundbite. The world is not black and white, and sometimes, as the famous one-liner goes, you can be so heavenly minded that you are no earthly use.